K. Michelle (who I believe is still with Jive) released a medley seeming to take jabs at Jive records & Memphitz (yes Toya's Memphitz). This medley also has an ode' to Lupe Fiasco in it.. which I thought was so random, but she's a self proclaimed mermaid.... anything is possible. One thing I dig about her this far is that she's a button pusher. I like her though.. I think we finally have a female singer who we can feel to our core, but who can actually sing. #NoShade Im just sayin.. More on this & check the medley grown folks after the jump! K. Michelle has been rumored to make claims that her ex(??) Memphitz (Jive vp of a&r) exhausted her budget on Toya..among others that he was abusive to her while they were involved. 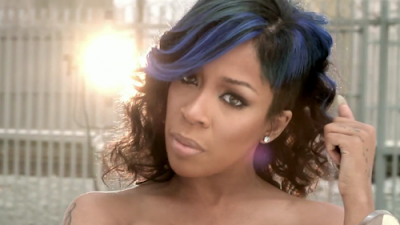 We dont know whats true or not, but the irony is guess who put me on to her.... TOYA! lol One day on twitter she tweeted something for us to check out..so this whole situation is just odd. In this medley she's going for Jive telling them that she's not Keyshia Cole (agreed) but whats funny is when I was trying to find a photo of her for the site, I could def see the resemblance in her promo pics..some of which are photoshopped to the nines and look nothing like her, but like Keyshia...?? Im just saying...I dont doubt this Jive struggle she claims she's having.. labels do grimy stuff. I may dig her album.. I think the lyrics are a bit over the top, but thats her prerogative & she's been through it according to her so this is her story. Let me know what yall think! Check it out below.